We had another earthquake in China today! This one along the northern Tian Shan Mountains, on the other side of the orogenic wedge from the earthquakes from earlier today. This M 6.3 earthquake is along a thrust fault, while the earlier M 6.5 earthquake had a strike-slip (slightly oblique) sense of motion. Here is the USGS website for this M 6.3 earthquake. This is my Earthquake Report for the M 6.5 earthquake from earlier today. Here is a report from The Earth Observatory of Singapore. Here is a report from earthquake-report.com. I plot the seismicity from the past month, with color representing depth and diameter representing magnitude (see legend). I also include USGS epicenters from 2007-2017 for magnitudes M ≥ 4.5. I also include the USGS moment tensor for today’s earthquake. I placed a moment tensor / focal mechanism legend on the poster. There is more material from the USGS web sites about moment tensors and focal mechanisms (the beach ball symbols). Both moment tensors and focal mechanisms are solutions to seismologic data that reveal two possible interpretations for fault orientation and sense of motion. One must use other information, like the regional tectonics, to interpret which of the two possibilities is more likely. Based upon the series of earthquakes and the mapped faults, I interpret this M 5.1 earthquake as a left-lateral strike-slip earthquake related to slip associated with the Gorda plate. In the upper left corner are two figures showing the tectonic regime (upper panel) and the major fault locations overlain upon topography (lower panel). This is from a paper that discusses how convergence in the Late Carboniferous contributed to the regional tectonics today (Han et al., 2011). I include blue stars in the general location of the M 6.3 earthquake. In the upper right corner is another large scale geologic map of the region (Han et al., 2011). This map shows the different geologic units, sorted by age. Major cities and basins are labeled. In the lower left corner I include a figure from Yang et al. 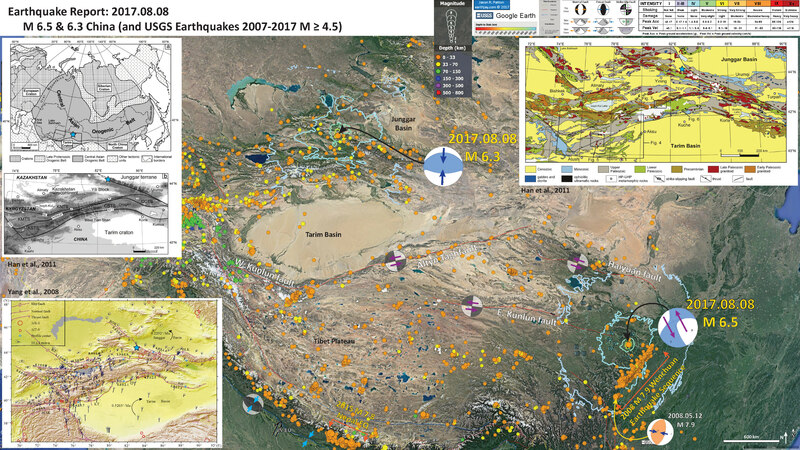 (2008) that shows the medium scale fault mapping in this region (more detailed than the other maps on the poster). GPS velocities and slip rates calculated for various faults in the region are also plotted. Today’s earthquake appears associated with the Northern Tianshan Marginal fault, a thrust fault that crosses the Tainshan Mountains (See Li et al., 2016 map below). Here is the poster from the M 6.5 earthquake. Here is a figure from Han et al. (2011) that shows the major tectonic and geologic features. I include a subset of their very long figure caption below in blockquotes (you are welcome, for my not including their entire caption). (a) The Central Asian Orogenic Belt is the tectonic assembly of continental and oceanic terranes between the European craton in the west, the Siberian craton in the east, and the North China and Tarim cratons in the south due to closure of the Paleo-Asian Ocean in the Phanerozoic (modified from Şengör et al., 1993; Jahn et al., 2000). (b) Topographic and sketch tectonic map of the western segment of the Tian Shan in China–Kyrgyzstan contiguous regions. KNTS — Kyrgyzstan North Tian Shan, KMTS — Kyrgyzstan Middle Tian Shan, KSTS — Kyrgyzstan South Tian Shan, and CSTS — Chinese South Tian Shan, AISNQF — Atbashy–Inylchek–South Nalati–Qawablak Fault, TFF — Talas–Fergana Fault, NL — Nikolaev Line, NTT — North Tarim Thrust, and NTSF — North Tian Shan Fault. Here is a larger scale figure from Han et al. (2011) that shows the geology and faulting. I include their figure caption below in blockquotes. Geological map of the western segment of the South Tian Shan Orogen and adjacent tectonic units (modified from IGCAGS, 2006). AISNQF — Atbashy–Inylchek–South Nalati–Qawablak Fault, TFF — Talas–Fergana Fault, NL — Nikolaev Line, and NTT — North Tarim Thrust. Here is a series of figures from Yang et al. (2008) that show the earthquake fault slip rates and block rotation rates, along with Global Positioning System (GPS) analyses results. The uppermost figure is in the interpretive poster above. The middle panel shows the GPS locations and GPS transect regions. The lower two panels show GPS velocities along the transects plotted in the middle panel map. The profiles show how tectonic strain is accumulating across the faults in the region (where there are inflections in the velocities). I include their figure caption below in blockquotes. Horizontal movement velocity field of the Tianshan Mountains relative to stable Eurasia plate. The arrows show movement rate and its orienta-tion with the error ellipse, at a 95% confidence level. TA, Talas-Fergana fault; KT, Kindyktash fault; BOK, Boluokenu fault; PMT, Main Pamir thrust; MAK, Markansu fault; PC, Puchang fault; MDKA, Maidan-Karatieke fault; KT, Kepingtage thrust fault; BL, Beiluntai fault; QL, Qiulitage fracture; XD, Xingdi fracture; BLK, Balikun fracture. Profile configuration. A, B, C, D, E, and F are longitudinal profiles across the Tianshan Mountains for Figure 4. G, H, I, J, and K are profiles across the WN-SE trending strike-slip faults for Figure 3. The velocity profiles across the WN-SE trending strike-slip faults in the Tianshan Mountains. G and H, the northwest and southeast sections of Talas-Fergana fault respectively; I, indyktash fault; J and K, the west and east sections of Boluokenu fault respectively. The horizontal axis represents distance from GPS sites to central point of profile, and the vertical axis shows GPS velocity. GPS velocity profiles across the Tianshan Mountains illustrated in Figure 2. The horizontal axis represents distance from GPS sites to central point of profile, and the vertical axis shows GPS velocity. Here are some figures from Li et al. (2016) that shows detailed fault maps for this region, along with a low-angle oblique block diagram for the region outlined in yellow on the map. The M 6.3 earthquake is just to the west of the block diagram, but the structure is representative.I include their figure caption below in blockquotes. Geomorphological and Tectonic features of the Tianshan Mountains. 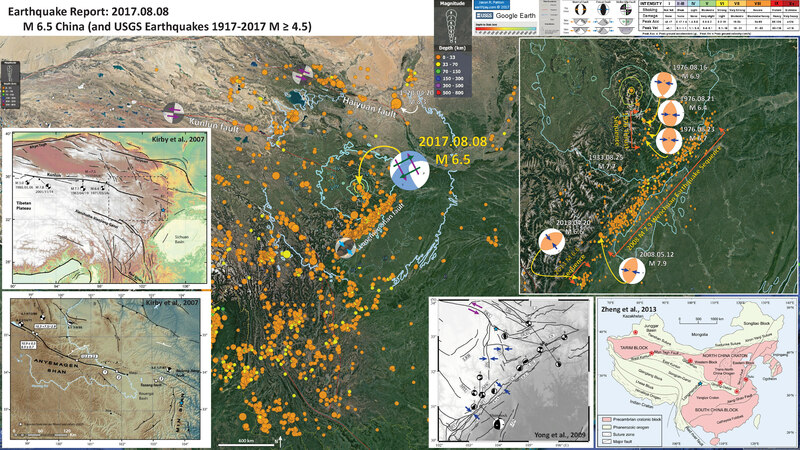 (A) Study area and earthquakes that were used for the formation of the receiver function image, which were selected from more than 500 earthquakes from a USGS database that was created during this study’s data collection. (B) Geomorphologic and tectonic features of the Tianshan Mountains, which show their segmentation with latitude and zoning with longitude, Cenozoic faults36 and Paleozoic subduction zones9,11–14,62, the asymmetry of structural deformation near the surface on both sides12, the crust’s velocity and direction from GPS data60,61, and the clockwise rotation of the Tarim Blocks22,40. The primary DEM data that were used for the geomorphological features in (B) are in the SRTM GTOPO 30 format and were provided by NASA and downloaded from http://glcf.umiacs.umd.edu in 2010. Cartoon map of Segment C in the Tianshan Mountains. (A) Geomorphologic features of Segment C in the Tianshan Mountains. (B) Deep structures and the driving mechanism for the uplift of the mountains during the Cenozoic. The abbreviations are the same as those in Fig. 2. The primary DEM data that were used for the geomorphological features in (A) are in the SRTM GTOPO 30 format and were provided by NASA and downloaded from http://glcf.umiacs.umd.edu in 2010. Zheng, Y-F., Xiao, W-J., and Zhao, G., 2013. Introduction to tectonics of China in Gondwana Research, v. 23, p. 1189-1206.